Government incentives and new IT options spur adoption growth among physicians. Whether due to the approaching Medicare-related deadlines or the expectation that funding for electronic medical records (EMRs) will play a key part in the upcoming economic stimulus package, there has been a definite uptick in the number of small to midsized healthcare providers actively seeking to implement EMRs. According to a recent report by healthcare market research firm Kalorama Information, the EMR market is expected to grow by 14.1% annually through 2012. With the tier 1 market segment (large hospitals) approaching full saturation—approximately 80% already employ EMRs—and tier 2 (large medical groups) adoption slowing, much of that growth will be coming from the bottom up. A segment of the healthcare industry that as recently as the summer of 2006 recorded only a 3% to 4% EMR adoption rate, tier 3 providers (smaller private practices) are now clamoring to implement the systems. This is no small thing: According to U.S. Census reports, of the 5.3 million physicians at work in the United States, some 60% are small to midsized practice providers. In some cases, physician-initiated EMR implementation inquiries actually increased more than twentyfold in December 2008 alone compared with the previous six-month period. And 2009 looks to continue, if not significantly expand, that trend. So what’s changed? In a word, everything. Healthcare providers understand the pressures—governmental, as well as from insurance companies—forcing them to make the switch to EMRs. The truth is, the majority would likely be more than happy to do so. The operational efficiencies to be gained are significant, and it’s commonly understood at this point that switching to EMRs would have a beneficial impact in terms of providing better patient care, streamlining reimbursement, and reducing medical errors. That’s not even to mention the escalating Medicare payment penalties physicians face if they don’t make the switch in time. Nor does it take into account the growing trend of health insurance companies requesting that claims come from EMRs rather than paper records in an attempt to reduce the incidence of inaccurate claims. Unfortunately, this vast segment of the healthcare community has long been held back from EMR adoption by two main hurdles: cost and, to an even larger extent, complexity. Together, these two obstacles have kept tier 3 EMR adoption rates in the single digits. Historically, implementing EMR systems required physicians to make large cash outlays, for the system itself as well as the required hardware and ongoing IT support. Accounting for many tens of thousands of dollars or more, the total up-front costs have simply been prohibitive for the majority of small to midsized organizations looking to take advantage of EMRs. More troubling, from the physicians’ perspective, is the complexity associated with introducing a major IT component to a business that has never before had to depend on technology. Physicians and their staffs are not in the IT business and most often have no IT staff to call on to assist in either implementation or support. Today, there are other, better options, and it is their availability that is in large part spurring the newfound urgency to implement EMR systems in the tier 3 sector. Leading EMR systems are now being offered in a far more cost-effective manner that eliminates the complexity barrier. Application service provider (ASP) models of these systems make it easier for small to midsized providers to take part in the EMR revolution and at a much more agreeable entry point. The most obvious benefit of utilizing a fully hosted, ASP-delivered EMR is the cost. Instead of laying out huge up-front costs on software licenses, hardware, and IT assistance, the hosted model changes the cost structure entirely, placing it well within reach for most tier 3 providers. ASP delivery allows for providers to implement and use an EMR on a subscription basis for a smaller, proportional monthly fee. And since the technology vendor hosts the entire system, there is little to no hardware expenditure required on the medical provider’s part. Better yet, full service hosting of EMR systems from the best providers ensures total HIPAA compliance right at the server level and sidesteps the need for long and expensive implementation cycles. But simply providing ASP versions of EMRs is not enough. In fact, EMR vendors have been offering such models for some time, and it’s had little effect on tier 3 adoption rates. The real tipping point in the new surge of physician-initiated EMR outreach is the opportunity to make use of, for lack of a better phrase, “virtual IT departments.” Again, physicians are in the business of caring for patients, not IT. At the same time, an EMR is a complex system that requires ongoing IT support and maintenance. With no in-house IT staff to call on, medical providers are left to seek out consultants and contracted IT assistance, which can greatly expand the long-term cost of any system. Thankfully, there are now IT groups that act as physicians’ dedicated IT departments, providing the “glue” to implement and maintain the system moving forward. And they’re accomplishing this at a fraction of the cost of hiring staff to do the same. Ideally, this IT group will be the EMR vendor or reseller itself. Certified in EMRs, the right partner can provide cost-effective, unlimited IT support both during and after the transition. And by doing that, the physicians sidestep issues of complexity entirely. As the new administration has made perfectly clear, the digitizing of American health records is a priority in terms of both economic stimulus and healthcare reform. President Obama’s ultimate goal is to have an interconnected, interoperable health information network fed by EMR data. Once realized, that network will go a long way toward increasing efficiencies and decreasing costs associated with healthcare. The first step, however, is getting as many physicians as possible onto EMR systems. With greater incentives coming from Washington and new, flexible, and affordable IT possibilities available, the industry as a whole is moving strongly forward toward the goal of a more connected, efficient, and intelligent healthcare system. 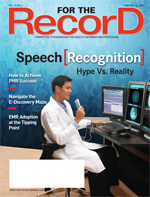 After many years, EMRs are poised to achieve critical mass. — John E. O’Keefe is CEO of ITelagen, a provider of HIT and related support.